LinkedIn has launched its latest tool for sales professionals – Sales Navigator, which aims to help sellers reach buyers through the social network. What’s interesting about Sales Navigator is that it’s being branded as a “stand-alone experience” and a software as a service solution, which uses a separate login from a user’s LinkedIn account. The tool also pulls together insights from several accounts, which makes it easier for salespeople who are managing more than just a few accounts and previously had to do manual searches for all of them. Now available for both the desktop and mobile, Sales Navigator gives salespeople account recommendations for new leads. 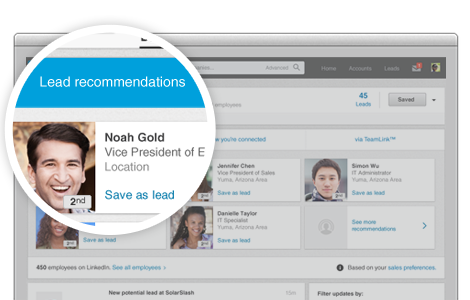 There are also options for running advanced leads searches, as well as options to use LinkedIn’s other tools, including its mail system through InMails, Who’s Viewed Your Profile, and TeamLink, which allows users to find their team members’ connections and former colleagues. For salespeople looking to leverage relationships with existing contacts, if any key contacts make the news or are featured in the media, those contacts will also show up with the tool, thanks to an integration with Newsle. Salespeople also get notifications if their contacts switch roles, take new jobs, or if they have mutual contacts on LinkedIn they haven’t connected with yet. 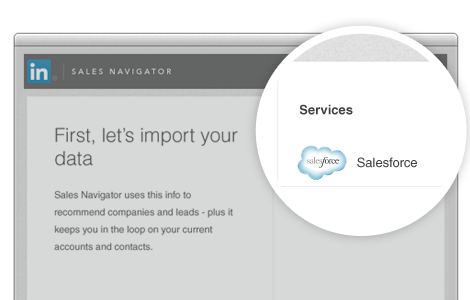 Aside from the Newsle integration, Sales Navigator also pulls together a customer relationship management integration with Salesforce and Microsoft Dynamics. “As the leader of a large sales organization, I’ve seen first hand how social selling can benefit and transform sales teams. It has the power to reduce cold calls, and turn them into warm introductions,” wrote Mike Derezin, global head of sales and sales solutions at LinkedIn, in a blog post. However, in his post, Derezin added LinkedIn members not using the Sales Navigator tool can still decline connection requests or block members, if they don’t want to receive requests to connect from salespeople. Right now, LinkedIn has currently served up the Sales Navigator tool to ADP, HootSuite, Juniper Networks and Swiss Re in a pilot phase. Pricing is set based on the number of users who have access to Sales Navigator. LinkedIn currently has about 316 million members, Derezin said.